Between the 1st and 3rd March 1917 the 6th Battalion moved from FOSSEUX to SOUSTRE before finally arriving at FONQUEVILLERS and establishing Headquarters in the abandoned brewery. At this time 2/Lt Albert Leslie Palmer (aged 19) was wounded and later died of his wounds at the Casualty Clearing Station in Walincourt Halte. See here. 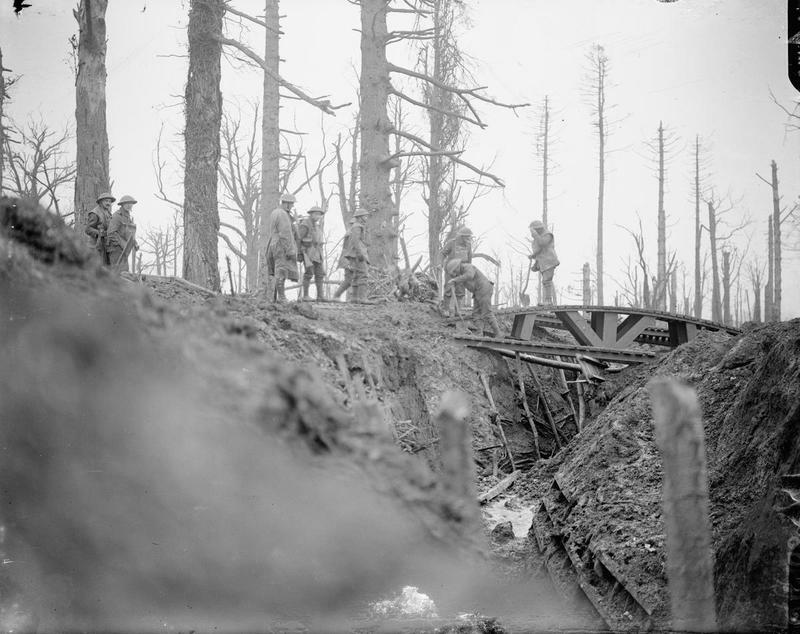 British soldiers construct a bridge over an old German trench at Gommecourt. 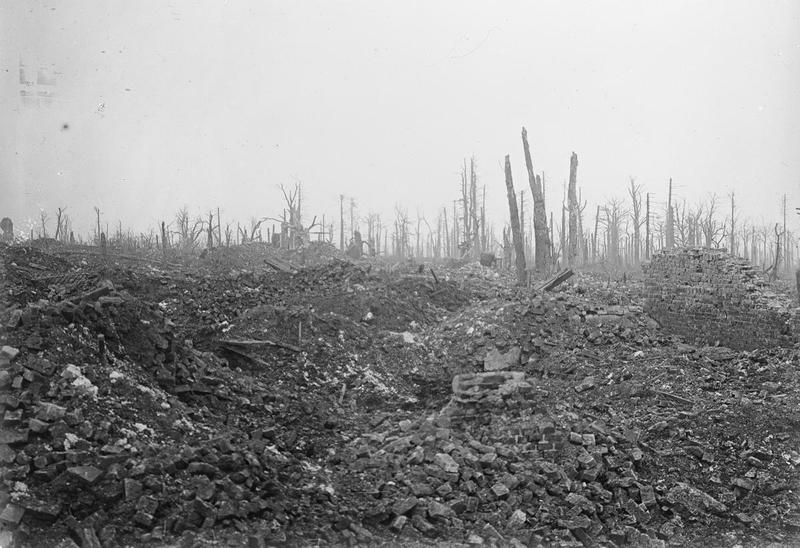 A great deal of mud and many blast-damaged trees can be clearly seen in March 1917. Image Courtesy of the Imperial War Museum © IWM (Q 4905). At 8.30 on the morning of the 5th March Headquarters along with “B” and “C” Companies moved into Gommecourt and by 10pm that evening they had relieved the 8th Battalion in the LEFT GOMMECOURT SECTOR. “Pigeon Wood” was captured during the afternoon, after some fighting and an unpleasant sort of game of hide and seek, and we also occupied Rettemoy Farm, and “The Z”. 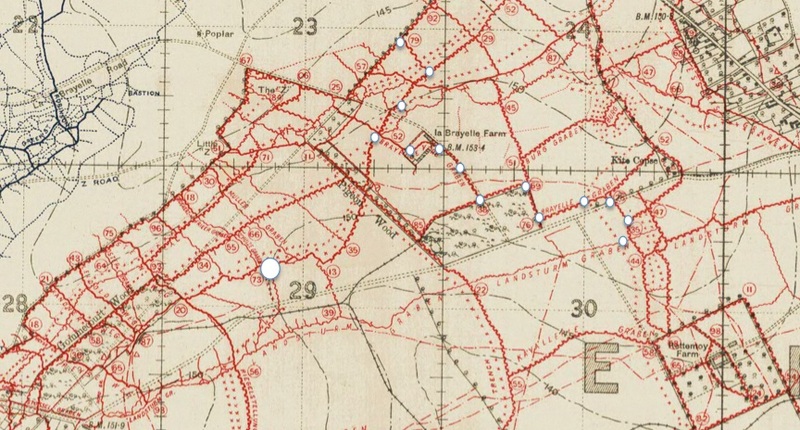 Evidently thinking that we were too close on his heels, the enemy delivered a determined counter-attack about 6 p.m. against C Company, who were holding the trench line in front of La Brayelle Farm, forcing them to withdraw slightly. During this attack Lieut. Duff did magnificent work in holding off a bombing attack, and L.-Sergt. Sansom gallantly held on to a bombing post which was cut off, until he was rescued by a party ably led by Corpl. Street, who went forward under heavy fire, and opening fire on the attacking enemy, enabled the post to withdraw. Sergt. 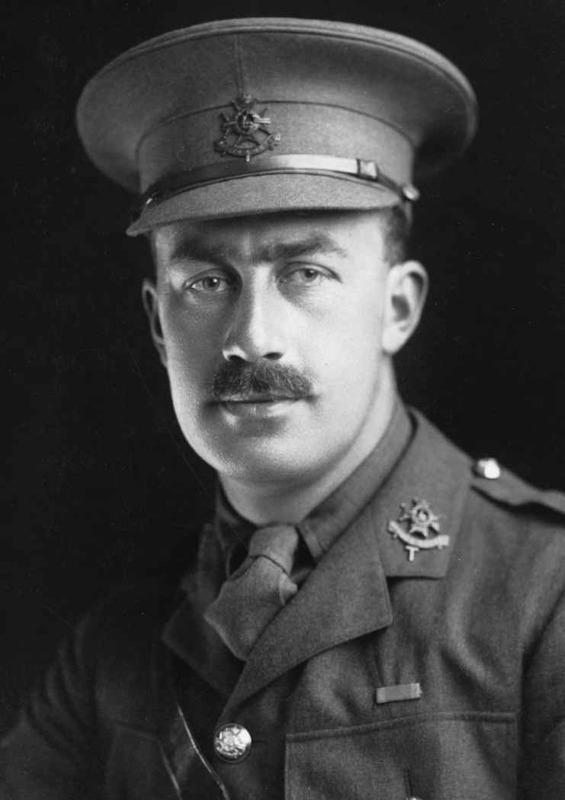 Henley also did splendid work in holding his post against a strong bombing attack, until he was eventually wounded in the head, dying the next day. The Battalion suffered a great loss the same day by the death of Lieut. Abrams, who was killed during the afternoon whilst reconnoitering near La BrayeIle Farm. Thinking, apparently, that the coast was clear, he was walking across the open with his batman when a Boche machine gun suddenly opened fire on them at close range, killing them both instantaneously. C Company then came under the command of Lieut. A. Bedford. The casualties that day in other ranks, were seven killed and 17 wounded. Very little happened on Match 5th, except a certain number of bombing encounters, and at night the 5th Battalion took over the right portion of out front from Rettemoy Farm to “Brayelle Graben”. On March 6th, we were relieved by the 6th Battalion, commanded by Major Ashwell, and moved back to dug-outs in and around Gommecourt. It was with much regret that we heard on the 9th that Major Ashwell had been badly wounded. 6th Battalion Headquarters was established in the old German 3rd line at G.29.A.8.3. “B” and “C” Companies occupied the frontline, “A” Company was placed in support in PIGEON TRENCH and “D” Company remained in reserve in LANDISTURM GRABEN. The frontline held by “B” and “C” Companies was E.23.D.7.9. – E.23.D.9.7. – E.23.D.70.45 – E.23.D.5.2. – BRAYELLE GRABEN to E.30.A.6.9. – E.30.B.2.8. – E.30.B.3.5. 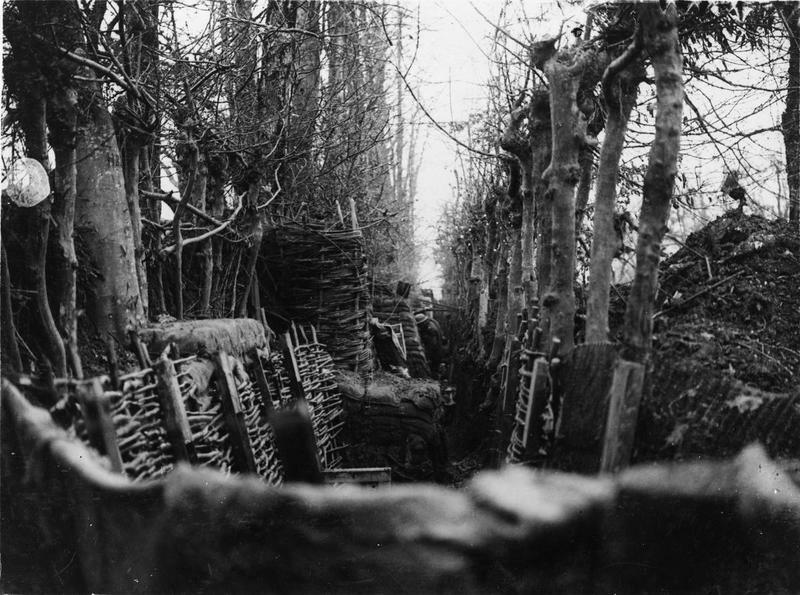 A well concealed and revetted trench between two-lines of trees in Gommecourt; given up by the Germans in March 1917. Image Courtesy of the Imperial War Museum © IWM (Q 4904). 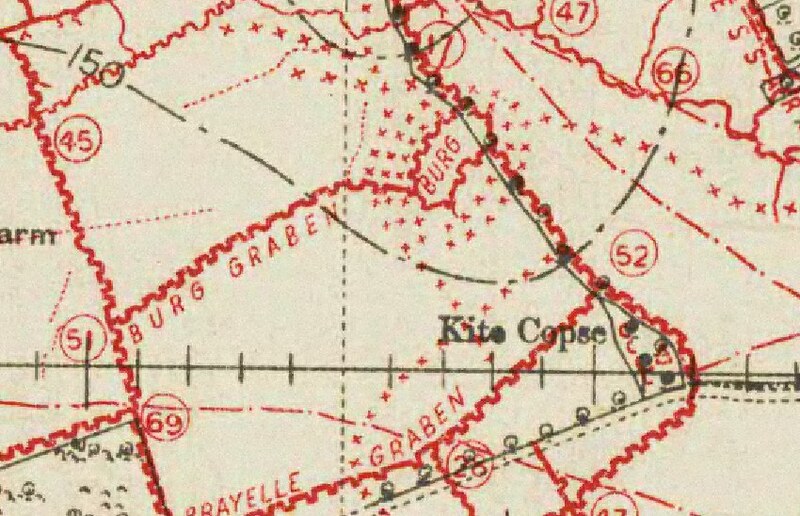 At 11pm on the 8th March 1917 “B” and “C” Companies attacked KITE COPSE and the BURG. 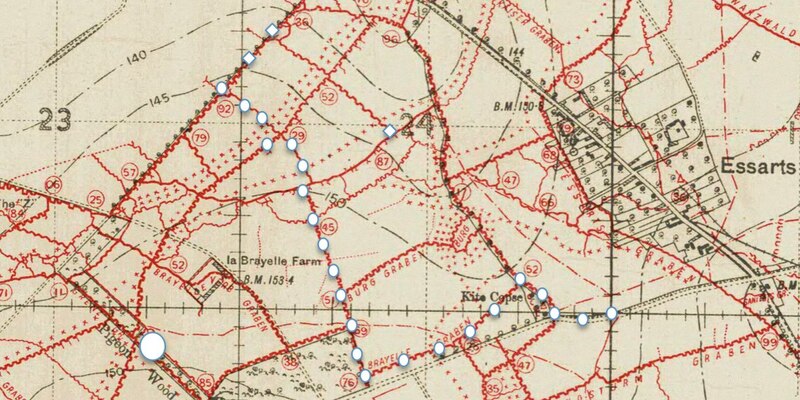 By 1am the following morning “B” Company was holding KITE COPSE and the trenches running S.W. from the corner. However, the BURG was still strongly held by the Germans and the extent of the wire can be clearly seen on the map (see above). Unfortunately I have been unable to locate any personal accounts of this action and both the Battalion War Diary and History provide only scant details. It does appear however from the list of wounded men that "B" Company were heavily engaged in Pigeon Wood on the 8th March and suffered at least 12 wounded men. By 4am in the morning Major Arthur Lindley Ashwell was wounded in KITE COPSE and Major Cyril Benson assumed Command of the Battalion. At 5.40am the Battalion evacuated KITE COPSE without loss, but had successful obtained identification of the 91st Reserve Infantry Regiment. 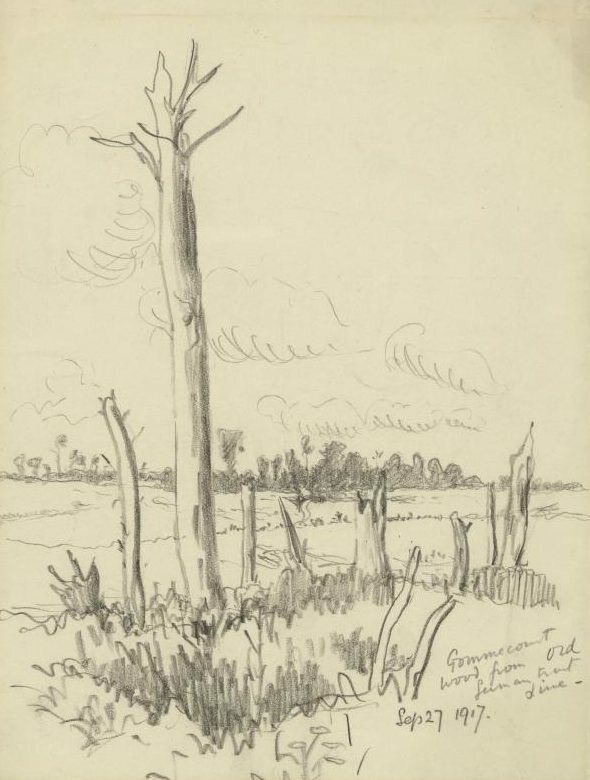 By 10pm in the evening of the 10th March the Battalion were relieved by the 8th Sherwood Foresters and moved in Brigade Reserve at Gommecourt. See later for details of casualties. 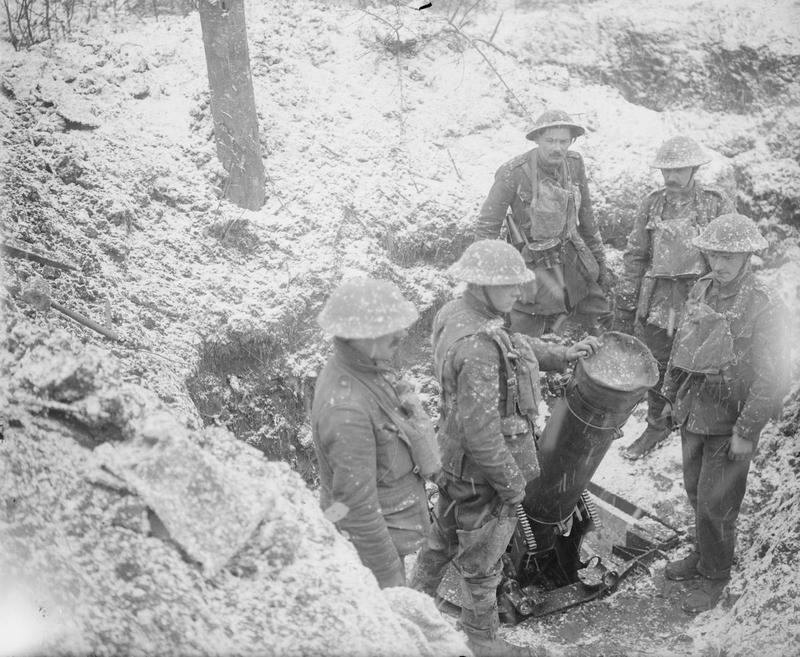 British 9.45-inch Heavy Trench Mortar and its crew in an old German trench in Pigeon Wood at Gommecourt in March 1917. Image Courtesy of the Imperial War Museum © IWM (Q 4921). 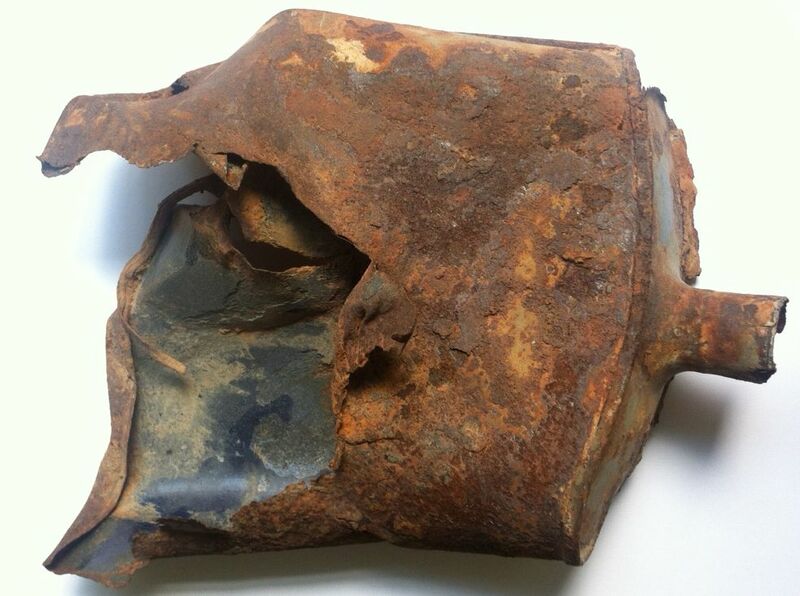 Although the area has returned to farm land the position of Arrow Copse has not changed over the last 100 years and evidence of the fighting can still be seen with the recovery of a British water bottle from the area of the BURG (below). 3841/241246 Pte. George Buckberry aged 22 and the son of Fredrick and Annie Buckberry of 18 Wesley St., Annesley, Woodhouse in Nottinghamshire. Enlisted in February 1915 and arrived in France with the V Reinforcement in November 1915. 7642/242439 Pte. Samuel Sykes aged 26 and the Son of William and Harriett Sykes of Rushley Cottage, Dore near Sheffield. Previously served with the Derbyshire Yeomanry and possibly arrived in France with the 29th Reinforcement in January 1917. 20028/242620 Pte. George Watson aged 22 and the brother of Thomas Watson of 8 Lambert’s Row, St. Peter St., Old Radford in Nottingham. Previously served with 1/7th Battalion (3564) and 2/5th Battalion (20028) before arriving in France with the 26th Reinforcement in December 1916. 5253/241877 Pte. Alfred William Weller aged 22 and Brother of Mrs. Bertha Bowrah, of 14, St. Martin’s St., Lewes Rd. in Brighton. Possibly a Derby Scheme recruit and arrived in France in 1916. 3879/241260 Pte. Ernest Palfreman aged 23 and the Son of Joseph and Mary Ann Palfreyman of Clay Cross; husband of Emma Jane Palfreyman of 71 Long Row, Clay Cross in Derbyshire. Enlisted in February 1915 and arrived in France in 1916. 1937/240332 Pte. Thomas Pickering aged 24 and the Son of Mr W and Mrs J Pickering of 5 Starporth Lane Terrace, Hasland in Chesterfield. Enlisted in May 1913 and arrived in France with 46th Division in February 1915. 2114/240422 L/Cpl. Samuel Barker aged 19 and the Son of Annie Fowell (formerly Barker) of Dig St., Ashbourne in Derbyshire, and the late Isaac Barker. Enlisted in February 1914 and arrived in France with the 46th Division in February 1915. Had previously suffered with trench foot in April 1916. 4267/241421 L/Cpl Bernard Millington. Enlisted June 1915 and arrived in France with the V Reinforcement in November 1915. 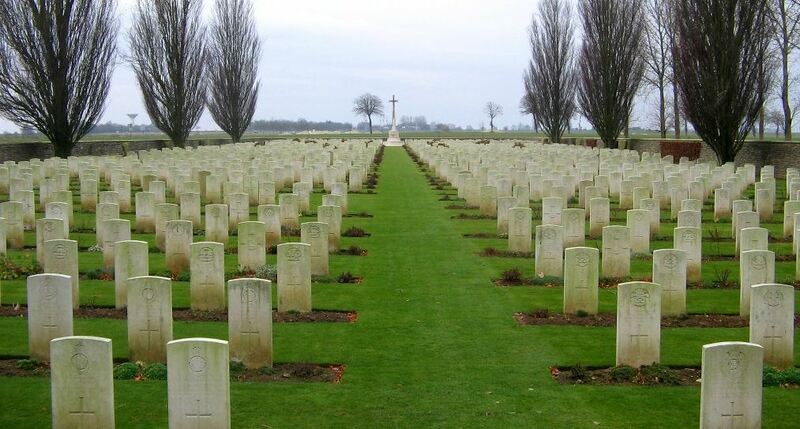 All the men were buried next to each other in Foncquevillers Military Cemetery Row 3D. 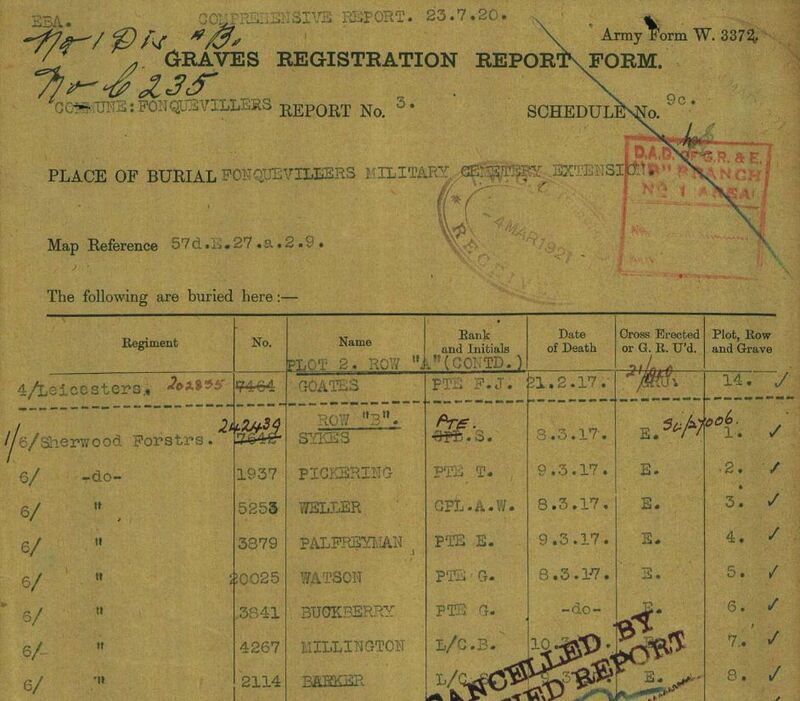 The preliminary Graves Registration Report Form from March 1921 records them as buried in PLOT 2 Row “A” Graves 1 to 8 (see above) but this was later changed to PLOT 3 Row “D” by April 1924 (see below). 4407/241499 Fred Gould who was aged 26 and the Son of John and Charlotte Gould of Bankside in Youlgrave Derbyshire. Fred’s body was not recovered after the War and he is now Commemorated on the Thiepval Memorial. Enlisted in July 1915 and arrived in France with the V Reinforcement in November 1915. Interestingly, the Graves Registration Unit in January recorded the recovery of one unidentified British Soldier from 24.D.1.6. which is located in the barbed wire belt close to the BURG and it is tempting to speculate that this might have been the body of Fred Gould. 1678/240209 Pte. Christopher Blankley who was made a prisoner of war. Enlisted April 1912 and arrived in France with the 46th Division in February 1915. Had previously been wounded at Kemmel in May 1915. 3528/241111 Pte. Stanley Allcock from Peak Dale who died of wounds at the 20th Casualty Clearing Station. 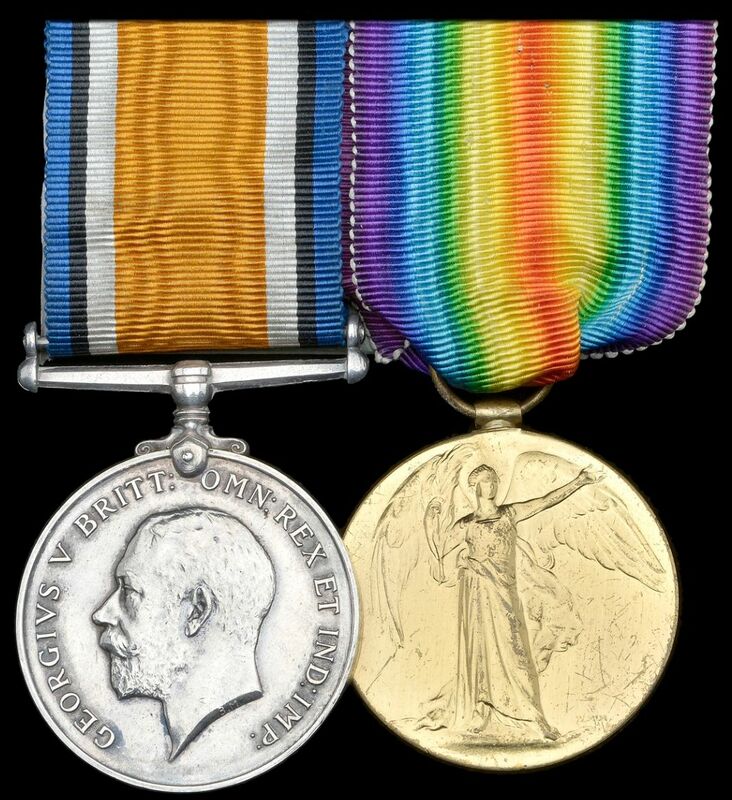 Enlisted November 1914 and arrived in France with the III Reinforcement in August 1915. 7652/242448 Pte. Edward Bibby. Formerly served with the 1st Derbyshire Yeomanry and arrived in France in late 1916 or early 1917. 242604 Pte. George Lokes. Formerly served with the 1/7th Battalion (344 & 20011) and arrived in France with the 26th Reinforcement in December 1916. All three men died of their wounds at the 20th Casualty clearing station and are buried in Warlincourt British Cemetery in Saulty. As a preliminary assault during the night of March 11/12th, a party from C Company under Corpl. Kirk successfully cut gaps in the wire in front of Hedge Trench. 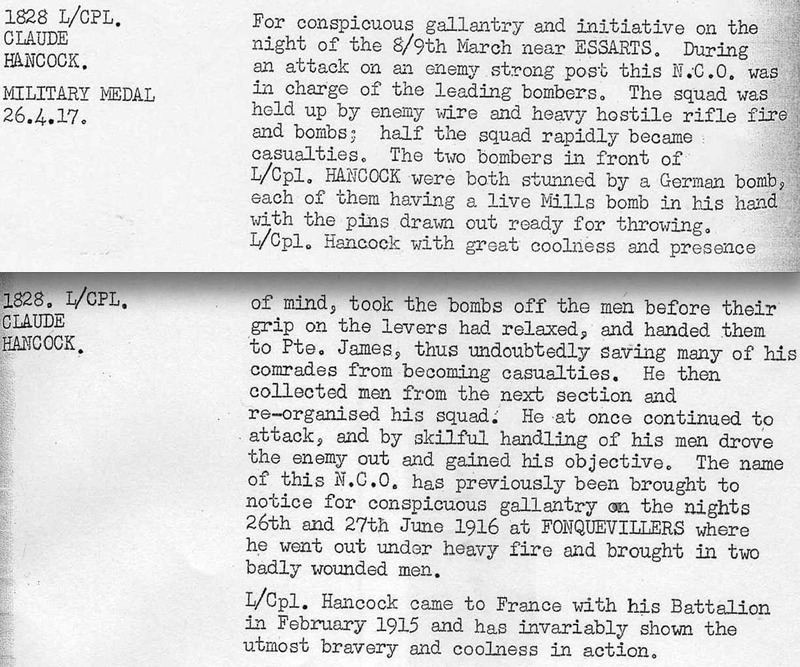 At 10pm on the 14th March the 6th Battalion relieved the 8th Sherwood Foresters in the LEFT GOMMECOURT SECTOR. The 8th Battalion has suffered over 30 casualties in trying to capture BURG GARBEN and HEDGE TRENCH during the previous few days. Headquarters was established PIGEON WOOD. “A”, “C” & “D” Companies were in the front line with “B” Company in support. The front line ran LANDSTURM GRABEN – F.19.C.0.0. – KITE COPSE – E.24.D.5.2. – BRAYELLE GRABEN – E.30.A.6.9. – E.24.C.4.5. – E.24.C.2.9. – E.23.b.9.2. Advanced posts were located at E.24.A.0.4. E24.C.80.98. & E.24.A.15.50. It was recorded in the Battalion War Diary that the enemy line was held as on the day before, but wire cutting north of the BURG continued. 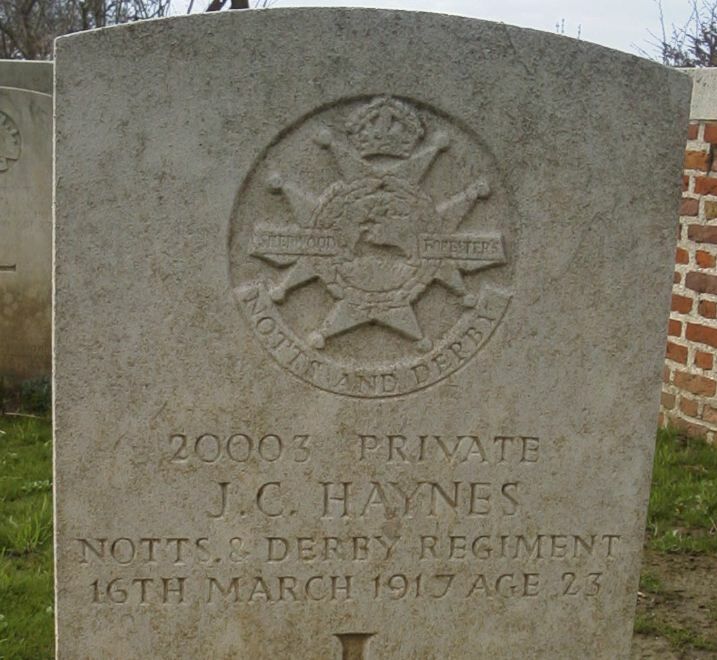 At this time 242506 Charles Haynes from East Kirby was killed and buried in Foncquevillers Military Cemetery. At 9.30 pm on the 16th March a loud explosion was heard in ESSARTS followed by the sound of transport during the night of the 16th/17th. At 6am on the morning of the 17th March patrols occupied the BURG and later the whole of HEDGE TRENCH without meeting any opposition. 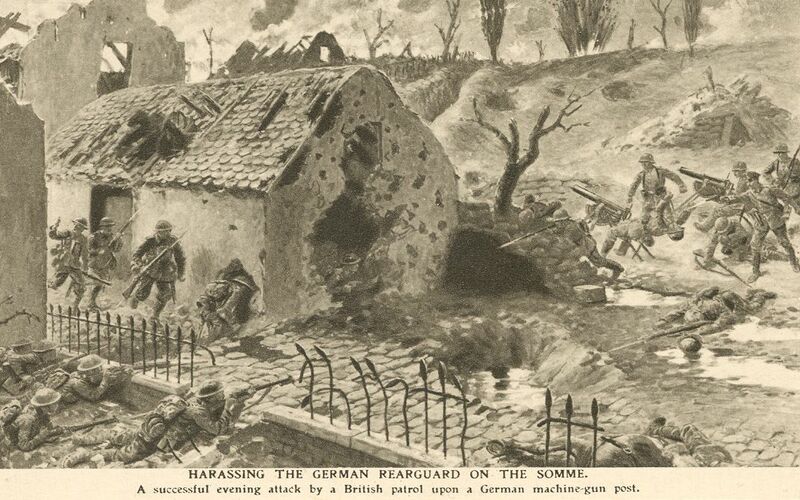 By 9am patrols had pushed into ESSARTS, followed by the reconnoitring of QUESNOY FARM at 3pm. However, there was a small German detachment firing machine guns from fortified farm and the patrol had to withdraw. During the evening the Battalion finally occupied and held Quesnoy Farm. The Battalion were finally relieved at midnight by the 4th Battalion Lincolnshire Regiment and moved to billets at St Amand. 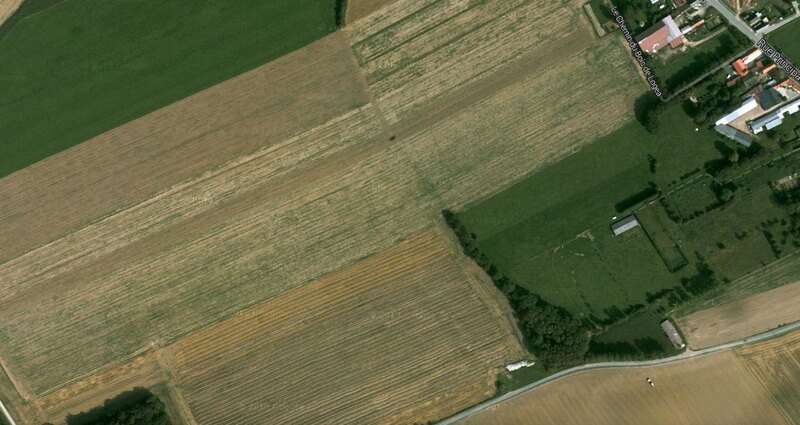 The site of Gommecourt and Gommecourt Wood beyond. Courtesy of the Imperial War museum © IWM (Q 4912). Never again did we go to Gommecourt, which we believe is being retained by the French untouched. As a type of German fortification it was probably one of the best, containing the deepest and best constructed trenches we ever saw. 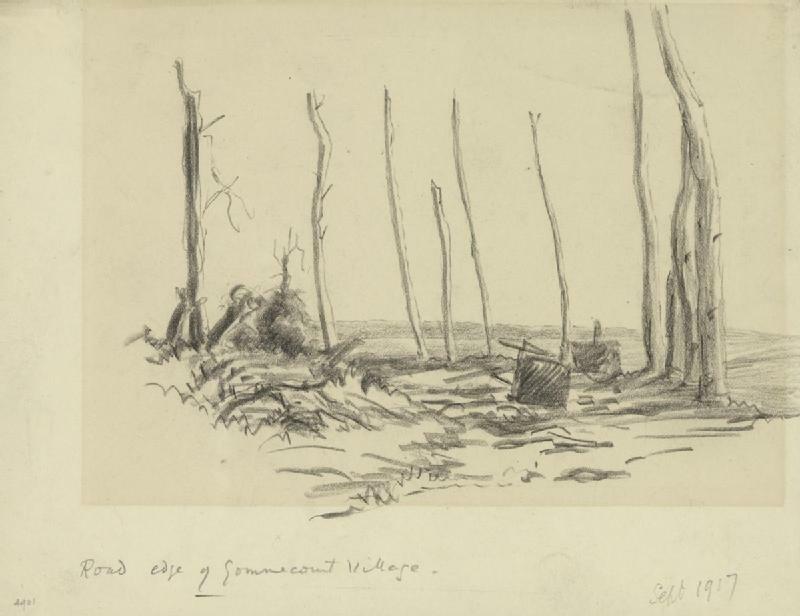 The wire in front was almost impossible to break through; each line of trenches was protected in much the same way; the dug—outs were deep and proof against all except the very heaviest of shells, and there was a long subterranean passage built by the Boche from behind Gommecourt Wood to his second line, along which reinforcements could be brought in safety to counter—attack any troops that might have gained a footing in the front line. It was sad to find magnificent tapestries and valuable pieces of furniture, evidently taken from the chateau, which once existed there, adorning the German dug—outs or ruthlessly cut and knocked about, but sadder still to find the bodies of our own Officers and men lying unburied exactly as they had fallen on that fated 1st of July, 1916. A view of part of a road lined by bare tree stumps and with two destroyed wheeled carts lying on their sides. Courtesy of the Imperial War Museum © IWM (Art.IWM ART 4901).